Father Peyton behind the scenes at Family Theater of the Air radio program. Father Pat was eager to reach ten million people with his message of the importance of Family Rosary Prayer and knew only with mass media on a national level could do it; that meant at the time, radio. Off to New York he went and persuaded a non-Christian woman from the Mutual Broadcasting System that his program would be just what American families needed. She agreed to give him the time if he could come up with a big Hollywood star to be on the show. Our Lady guided the nervous priest as he made a cold call to Bing Crosby, the famous Hollywood singer. Father Pat’s sincerity convinced Bing to be on the program. 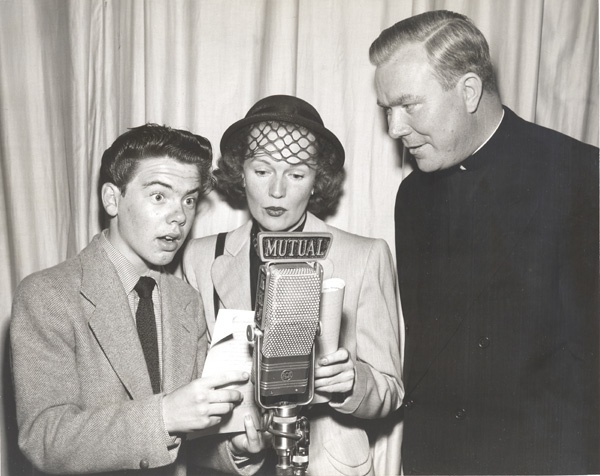 Father Peyton with Bobby Driscoll and Rita Johnson. 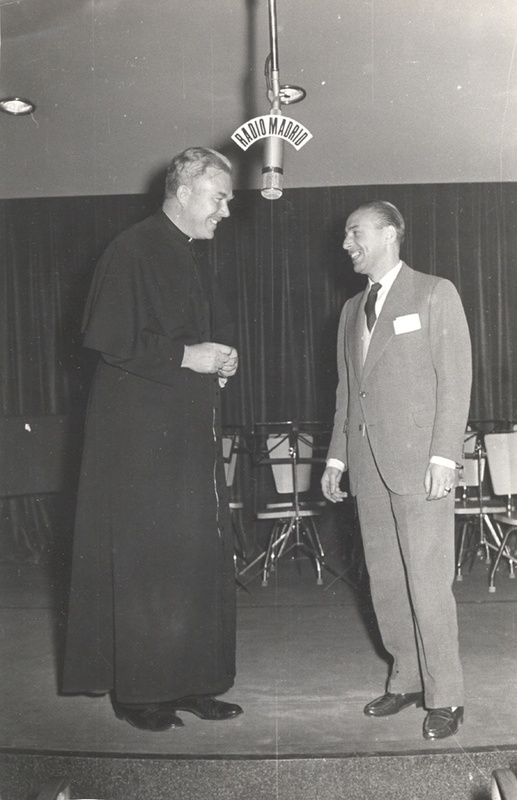 On May 13, 1945, families all over the country heard a program like no other, featuring Archbishop Spellman of New York, President Harry Truman, Bing Crosby and the parents and sister of the Sullivan family of Iowa leading the Rosary. Five brothers from that family had lost their lives when their ship went down in the war. Father Peyton finished the program with an impassioned plea for families to pray the Rosary together for peace. The program garnered the biggest following of any in the Mutual Broadcasting System to date. People wanted more! 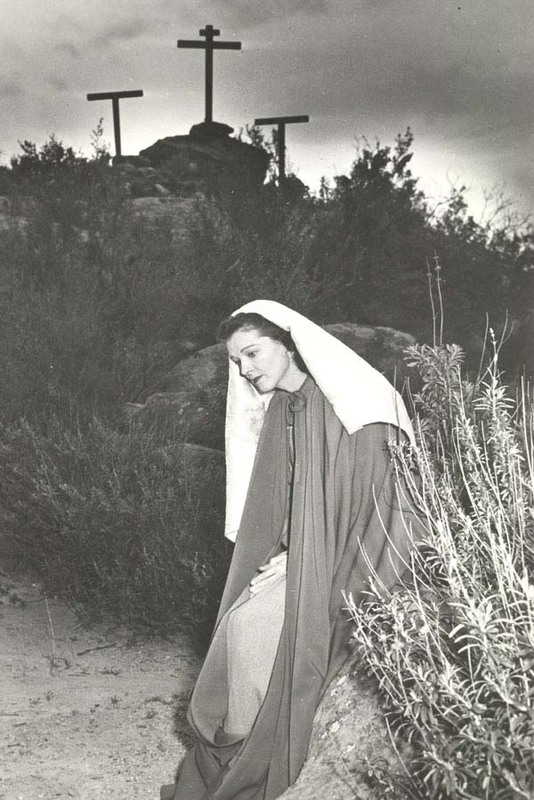 Hollywood fell in love with the “Rosary priest,” beginning with its biggest star, Loretta Young. 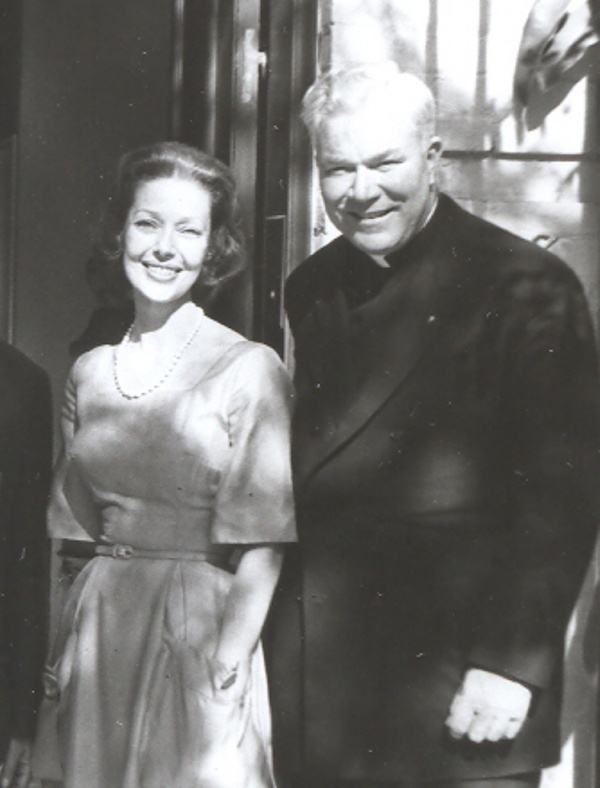 Father Peyton with one of his steadfast supporters, Loretta Young. 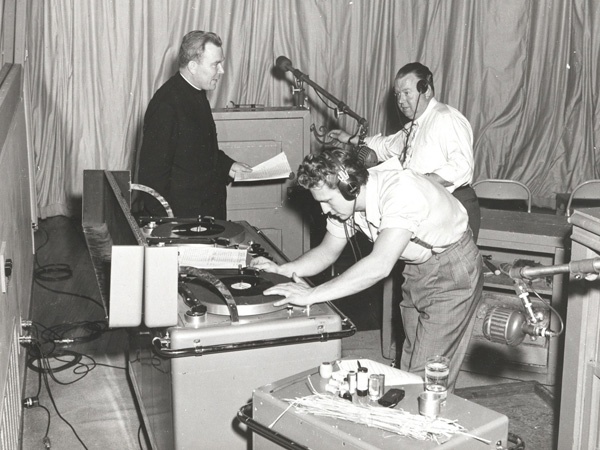 On the success of that first radio show, Father Peyton went to Hollywood to try to establish an ongoing program. Hearing Father Peyton express his vision to use the new media to reach millions, Raymond Burr, Jimmy Stewart, Rosalind Russell, Ann Blythe, Danny Thomas, Lucille Ball, and hundreds of big stars came to see Father Pat as their chaplain. 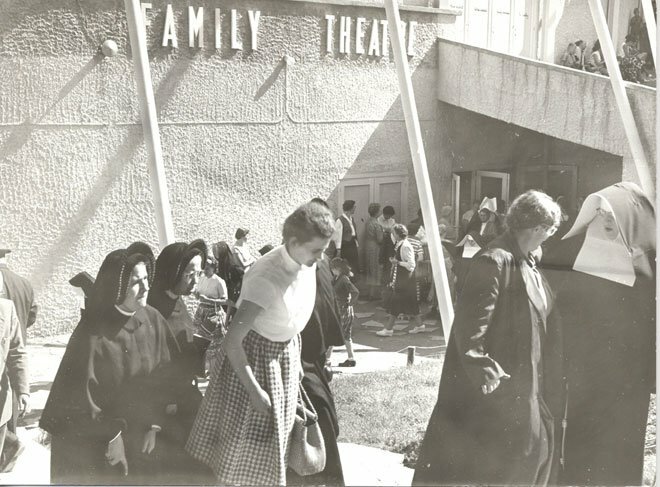 The Family Theater Productions became a reality in 1947 and a star-studded radio program of inspirational dramas ran for 22 years! “The Family That Prays Together Stays Together” became the famous motto! TV and film were to follow as the Catholic media pioneer matured along with Hollywood. Actress Ruth Hussey as Mary in Hill Number One. The Triumphant Hour, the story of the passion, death and resurrection of Jesus, was the first television program from Family Theater Productions and was featured on several networks during the Easter season in 1951. The cast included Pat O’Brien, Maureen O’Sullivan, Jane Wyatt, Don Ameche, Roddy McDowell, Morton Downey, Pedro de Cordoba, Jack Haley and the Bob Hope family. A scene from Dawn of America. Dawn of America was originally broadcast in 1953. This is the inspiring story of Christopher Columbus struggling to secure support to sail to the New World. He remains faithful and prays for the strength to overcome his obstacles. The story concludes with the discovery of America and Columbus' triumphant return to Spain. In the 1980s, Christmas and Easter Television specials were broadcast featuring stars such as Grace Kelly, Plácido Domingo and Frank Sinatra. Father Peyton engaged Peter Thompson (producer of the popular television program at the time, Quincy) in the early 1990s. In 1992, four films that are still viewed today, The Visit, The Search, The Hero and The Journey, were filmed and premiered in October at the Television Academy of Arts and Sciences in North Hollywood. Father Peyton promoting one of his projects on Radio Madrid. Father Peyton had a vision to create films on the 15 Mysteries of the Rosary after his experience of traveling the world and telling the story of Jesus and Mary to people who were hearing of these names for the first time. He envisioned it in 1956 as a gift to the Blessed Mother on the Occasion of the 100th anniversary of the Dogma of the Immaculate Conception. Due to delays it did not begin until 1956 however it was successfully completed in 1958. When Father Peyton had first taken his idea to Hollywood, some were supportive; others called it impossible, and a few even refused to listen, but he was undaunted. After many meetings with some of the great visionaries of Hollywood, the decision was finally made to dramatize the fifteen Mysteries as they were told in the Bible. They were to be half-hour programs suitable for television and re-edited as three major motion picture films. This was not part of the original plan. This was developed after they were made. The landscapes and architecture of southern Spain was like those of ancient Palestine. 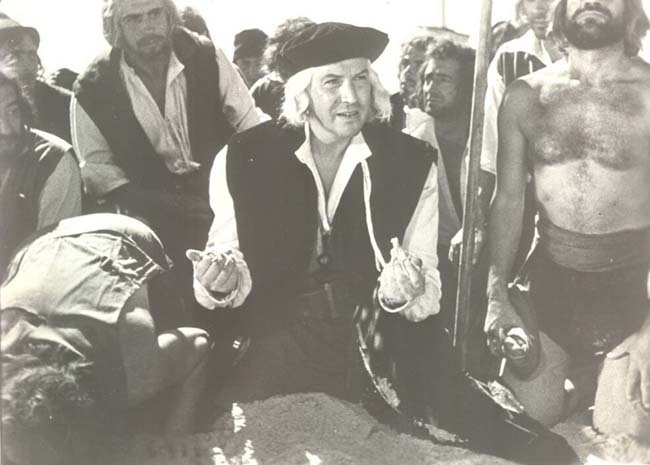 Spain was also a predominately Catholic country, therefore the Spanish actors would be familiar with religious dramas and well informed on the subject matter. 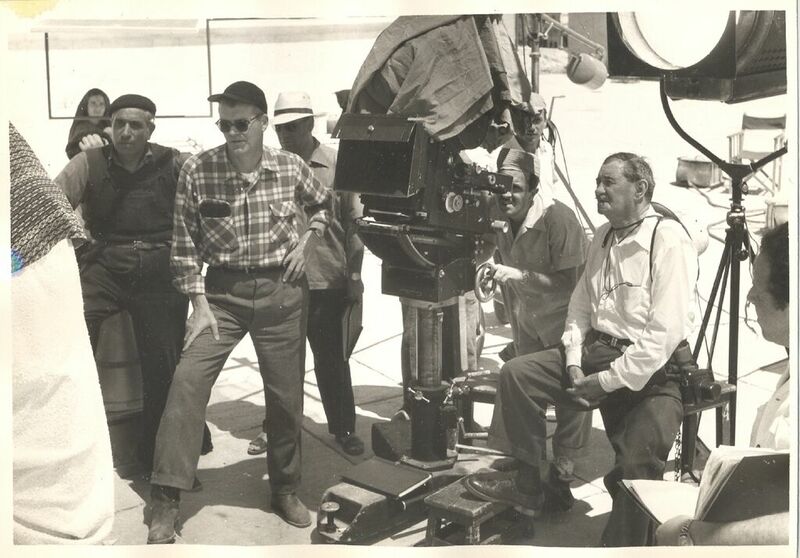 Director Joe Breen, Jr. supervising the filming of the Mysteries of the Rosary. May 1, 1958— Hundreds of thousands of people filtered through a little theater in the Official Vatican Pavilion at the World’s Fair in Brussels, Belgium to view the premier of The Life of Christ Series. The premiere at the Brussels World's Fair in 1958. “Keeping before the traveling public the importance of wholesome family life as part of the American heritage,” this was Father Peyton’s vision in 1947 when he inaugurated a Billboard Campaign. Under his direction, a Nationwide Billboard Campaign promoting family prayer was begun. 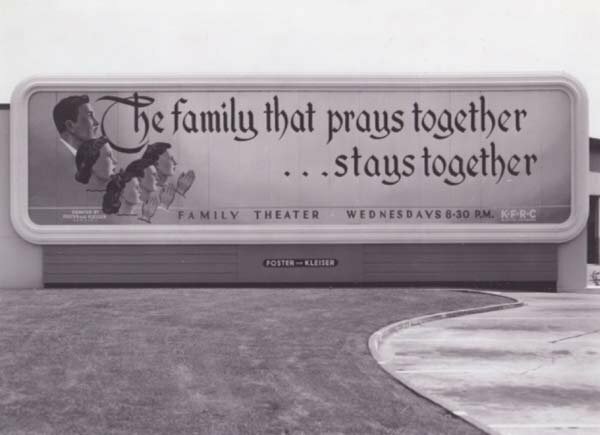 One of the first billboards appeared on Wilshire Boulevard, Hollywood, California with the slogan: “The Family That Prays Together Stays Together.” View other classic billboards here. 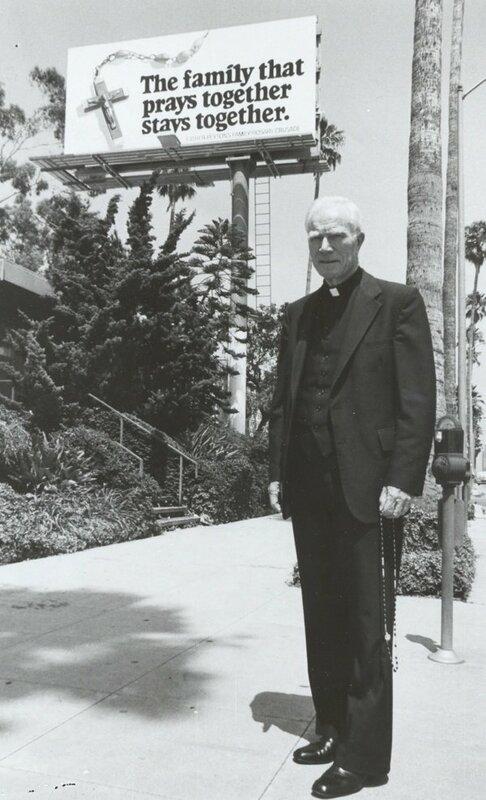 Father Peyton with the billboard erected near the Family Theater Productions' building for the Summer Olympics in Los Angeles, CA, 1984. Over the years, more than 200,000 Billboards have been displayed encouraging and supporting family prayer with simple, concrete and meaningful messages. “A World at Prayer is a World at Peace” billboard was placed before the public eye in 2011. After the attacks on the World Trade Center, great demand for our uplifting messages came in from outdoor advertisers not only in the New York area, but across the country. We invite you to contact us to learn more on the Billboard Campaign and even use some of the Billboard prints and slogans for your home or programs.